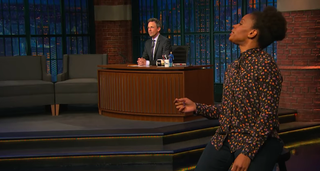 Late Night With Seth Meyers' Amber Ruffin thinks former Bears coach Mike Ditka's takes are "da worst"
Late Night With Seth Meyers’ Amber Ruffin is a consistently funny presence whenever the writer and comic pops up to deliver her signature brand of chirpy wisdom about the (invariably awful) news of the day. She memorably took Meyers on a tour of her “safe space” getaway in the 30 Rock offices, a post-Charlottesville magical sanctuary she’d requisitioned where white people are unable to touch her hair and Donald Trump’s name evaporates into muffled Charlie Brown teacher-speak. Well, after former Chicago Bears coach and football commentator who wants those punks to stay off his lawn Mike Ditka came out on Monday with a typically grumpy and reactionary take on black NFL players daring to kneel in protest of discrimination, Ruffin returned, taking the place of Meyers’ usual “A Closer Look” segment to drop a little knowledge. Ruffin noted that, as a guy who’s been around a sport where 70 per cent of the players are black, Ditka should have a whole lot more understanding, both of the players’ concerns, and of the fact that his comment that “there has been no oppression in the last 100 years” in this country makes him look like, well, a hopelessly out-of-touch has-been who’s been coasting on that one Super Bowl win for the last 30 years. “Charlottesville happend this summer,” exclaimed the incredulous Ruffin, “and then again three days ago!” Meyers, as ever playing the white guy foil to Ruffin’s insight about black America, responded dutifully concerning the true nature of the black experience, “That is not something I as a white person am qualified to talk about but from what I can glean… not great.” Ruffin, mocking the last time Ditka was in any way relevant (record in final five coaching seasons: 20-44, last seen leading the Saints to a 3-13 mark in 1999) echoed the also famously past-its-due-date Saturday Night Live “Da Bears” sketches in pronouncing Ditka on “daaa wrong side of history” for his crotchety call for protesting players to “go play somewhere else.” She also noted that the recent threat by fellow out of touch old coot and Dallas Cowboys owner Jerry Jones to bench any player who protests is literally “a white man threatening his black players with punishment if they exercise free speech.” Da worst, indeed.